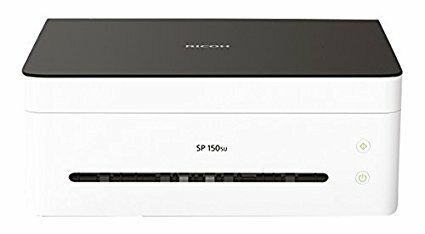 Ricoh SP 150suw is a very basic laser printer which currently retails at very attractive promotion price of RM359 plus a 3 year onsite warranty. Sceptical, I asked the salesman at All It Hypermarket, where is their service center. Always change replied the salesman. He added, actually Ricoh is a very big commpany but they focus on big high quality printers for corporations and only now getting into the home market with this basic printer. I just need a basic laser printer for printing receipts and other documents for income tax etc, it is very attractive. The model SP 150su without wireless is RM309. At only RM50 more for the wireless version, i bought the model with wifi. It has very small footprint, much smaller than the old Panasonic laser printer I had which frequently experiences paper jam. The SP 150su has a straight through paper feed which is relatively paper jam free. The reason I needed to abandon my old Panasonic printer was because of paper jam so this is the feature I needed. The printer install very easily and I was scanning, printing documents in short order. Initially I had problem with saving scanned documents because after completing scanning, the SAVED tab was grayed out and not clickable. After some fiddling around I discovered to make that SAVE tab active, I had to click on the image of the scanned document so after this discovery, I had not problem scanning and saving scanned documents. Look at this cute little small footprint printer which when placed on my desk occupied very little space. The only problem is that I had to provide enough space in front to take the printed documents which is spit out from the printer at very fast speed. Update: The software supplied with the printer is too basic. There were many cases where I couldn't print the files like pdf files I couldn't get the SP 150 to pint. I had to use printscreen and paste from the clipboard to a picture editor like the Irfanview, save the file before I could get something like what I needed to print. If I have a choice, I will buy a better printer.